Objective: Both spontaneous resolution and progression of mild pulmonary valve stenosis (PS) have been reported. We reviewed characteristics of the pulmonary valve (PV) to determine factors that could influence resolution of mild PS. Methods: Fifteen asymptomatic pediatric patients with spontaneous resolution of isolated mild PS were retrospectively reviewed. Results: There was no correlation between the PV gradient, clinical presentation, age at diagnosis, or PV morphology. The PV annulus was small at initial presentation, which normalized at follow up. When corrected for the body surface area (z-score), the PV annulus was normal in all patients, including at initial evaluation. Conclusions: Based on our observation, neither age at diagnosis, nor PV-morphology-influenced resolution of mild PS. The variable clinical presentation makes it difficult to categorize and observe mild PS by auscultation alone. The PV annulus z-score could be a useful adjunct to determine the course and serial observation of mild PS. Recent natural history studies based on echocardiographic Doppler gradients are equally confusing. Again, lack of progression,  resolution,  as well as worsening of mild PS in neonates and young infants  has been reported. In general, there is lack of consensus on the natural history and the frequency of observation in patients with mild PS. , We reviewed the clinical and echocardiographic characteristics of the PV in patients with isolated mild PS that resolved spontaneously over time. An attempt was made to identify factors that could influence resolution of mild PS. The study was approved by the institutional review board of the University of Minnesota. Fifteen asymptomatic pediatric patients (<18 years at diagnosis) followed for isolated mild PS (PV gradient <40 mmHg), between November 1994 and August 2009 were selected. Two staff pediatric cardiologists at the University of Minnesota performed a retrospective review of charts, echocardiography studies, and echocardiography reports. Echocardiograms were reviewed on a Hewlett Packard Philips Sonos 5500 Ultrasound machine. All measurements were corrected for gender and body surface area and were represented as z-score values. For echocardiogram images unavailable for review, information was extracted from patient charts and echocardiography reports. The patient inclusion criteria were clinical (at least a grade 2/6 systolic murmur or a murmur associated with a systolic click) or echocardographic [peak PV gradient of ≥16 mm Hg or an abnormal PV (thickened or doming)] evidence of mild PS. On the last follow up visit, patients had no clinical or echocardiographic evidence to suggest PS. 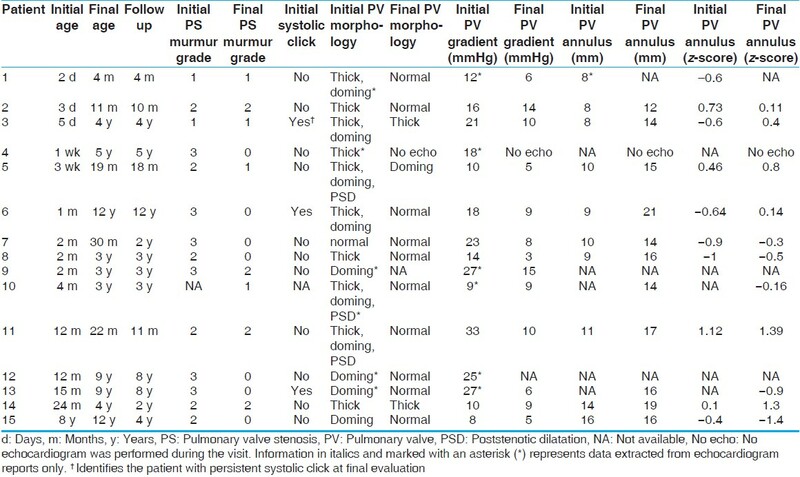 [Table 1] summarizes the clinical and echocardiographic findings of the 15 patients followed for mild PS. At presentation: The age ranged from 2 days to 8 years with a mean of 11.8 ± 25.3 months, median 2.4 months. Mean PV gradient was 18 ± 8 mmHg (8-33 mmHg). The PV annulus measured 10 ± 3 mm (range 8-16 mm) with a mean z-score value of -0.17 ± 0.73 (−1.00 - 1.12). All patients had a murmur consistent with PS with a mean grade of 2/6 (range grade 1/6-3/6). Echocardiographic images for six patients were not available for review; however, reports were available, and were reviewed. Three patients had a systolic click at the pulmonary area associated with the murmur. Clinical data were not available for one patient. The patients were followed for a mean interval of 47.5 ± 38.8 months, median 36.5 months (range 4 months to 12 years). At final evaluation: The patient age ranged from 4 months to 12 years with a mean of 59.3 ± 47.8 months, median 45.5 months. Mean PV gradient was 9 ± 4 mmHg (5- 15 mmHg). The PV annulus measured 15 ± 3mm (range 12-21 mm) with a mean z-score value of 0.08 ± 0.87 (−1.40 - 1.39). The mean grade for PS murmur was 1/6 (grade 0/6-2/6). Nine patients had improvement or complete resolution of the PS murmur, whereas, five patients had persistent PS murmur without any gradient by echocardiogram. There were insufficient data to comment on the clinical course in one patient. Only one of the original three patients continued to have a systolic click associated with the murmur. Even though the initial PV annulus diameter was smaller (10.2 ± 2.8 mm) compared to the final value (15.8 ± 2.5 mm), there was no difference when these values were corrected for the body surface area and expressed as z-scores (−0.17 ± 0.73 versus 0.08 ± 0.87, respectively). All the patients had normal (normal range −2.0 to ± 2.0) initial and final PV annulus diameter z-scores despite an abnormal appearing PV in many patients. It is possible that patients with progression of mild PS in previous reports had low PV annulus z-scores. Based on these findings, we believe that PV annulus diameter z-score values should be utilized in addition to PV gradients and physical exam to determine the management and follow up of patients with mild PS. Infants with mild PS and PV annulus z-scores of ≤-2.0 should be closely followed to monitor the adequate growth of the PV and resolution of PS. Additionally in our study, we found no correlation between the PV gradient and the intensity of the systolic murmur, presence of a systolic click, or the PV morphology by trans-thoracic echocardiogram at initial evaluation. The fact that even a thickened, stenotic, and doming PV, with poststenotic dilatation of the main pulmonary artery demonstrated significant improvement on the last echocardiogram is very fascinating [Figure 1]. The intensity of the murmur decreased on follow up in most of our patients. Even though it is known that PS murmur intensity is proportional to the degree of valvular obstruction in moderate and severe PS, it would be difficult to categorize mild PS based on auscultation findings alone. The morphology of the PV in patients with mild PS has variable presentations unlike patients with moderate or severe PS. Whereas, some patients with significant PV thickening and doming generated minimal PV gradients, others with minimal abnormalities of PV morphology produced higher PV gradients and louder murmurs. This makes it difficult to predict the natural history of the spectrum of mild PS. In general, no single factor determines the outcome of patients with mild PS. Although our study is limited by a small sample size, it raises valid questions and provides a basis for future investigations to determine the management and serial observation of patients with mild PS. Based on our observation, there was no correlation between the severity of the PV gradient, age at diagnosis, clinical presentation, or the PV morphology in patients with mild PS. Because of this variable presentation, it is difficult to classify mild PS by physical exam alone. Though the initial PV annulus diameter was smaller than the normalized final values, when expressed as z-score even the initial values were normal for all the patients. We feel that the PV annulus diameter z-score could be a useful adjunct to the PV gradient and physical exam to help in determining the course and serial observation of mild PS. 1. Campbell M. Simple pulmonary stenosis; pulmonary valvular stenosis with a closed ventricular septum. Br Heart J 1954;16:273-300. 2. Lange PE, Onnasch DG, Heintzen PH. Valvular pulmonary stenosis. Natural history and right ventricular function in infants and children. Eur Heart J 1985;6:706-9. 3. Lueker RD, Vogel JH, Blount SG Jr. Regression of valvular pulmonary stenosis. Br Heart J 1970;32:779-82. 4. Mody MR. The natural history of uncomplicated valvular pulmonic stenosis. Am Heart J 1975;90:317-21. 5. Danilowicz D, Hoffman JI, Rudolph AM. Serial studies of pulmonary stenosis in infancy and childhood. Br Heart J 1975;37:808-18. 6. Moller JH, Adams PJr. The natural history of pulmonary valvular stenosis. Serial cardiac catheterizations in 21 children. Am J Cardiol 1965;16:654-64. 7. Ardura J, Gonzalez C, Andres J. Does mild pulmonary stenosis progress during childhood? A study of its natural course. Clin Cardiol 2004;27:519-22. 8. Atik E. Mild pulmonary valve stenosis: The possible spontaneous cure in the natural history of the defect. Arq Bras Cardiol 2006;86:378-81. 9. Rowland DG, Hammill WW, Allen HD, Gutgesell HP. Natural course of isolated pulmonary valve stenosis in infants and children utilizing Doppler echocardiography. Am J Cardiol 1997;79:344-9. 10. Drossner DM, Mahle WT. A management strategy for mild valvar pulmonary stenosis. Pediatr Cardiol 2008;29:649-52. 11. Driscoll D, Allen HD, Atkins DL, Brenner J, Dunnigan A, Franklin W, et al. Guidelines for evaluation and management of common congenital cardiac problems in infants, children, and adolescents. A statement for healthcare professionals from the Committee on Congenital Cardiac Defects of the Council on Cardiovascular Disease in the Young, American Heart Association. Circulation 1994;90:2180-8. 12. Pettersen MD, Du W, Skeens ME, Humes RA. Regression equations for calculation of z scores of cardiac structures in a large cohort of healthy infants, children, and adolescents: An echocardiographic study. J Am Soc Echocardiogr 2008;21:922-34. 13. Hayes CJ, Gersony WM, Driscoll DJ, Keane JF, Kidd L, O'Fallon WM, et al. Second natural history study of congenital heart defects. Results of treatment of patients with pulmonary valvar stenosis. Circulation 1993;87(2 Suppl):128-37. 14. Hatle L, Angelsen B. Doppler ultrasound in cardiology. Physical Principles and Clinical Applications. Philadelphia, PA: Lea and Febiger; 1985. p. 97-292. 15. Lima CO, Sahn DJ, Valdes-Cruz LM, Goldberg SJ, Barron JV, Allen HD, et al. Noninvasive prediction of transvalvular pressure gradient in patients with pulmonary stenosis by quantitative two-dimensional echocardiographic doppler studies. Circulation 1983;67:866-71.